Within two back-to-back days this week, two competing transportation-funding initiatives qualified for the November ballot. In brief, Colorado voters will be asked whether they want (a) more money to go to transportation from the state’s General Fund budget or whether they want (b) to use new revenue from a tax increase to pay for transportation improvements. Initiative 167 would authorize up to $3.5 billion in transportation bonds that would have to be repaid by the legislature from the General Fund budget. The proposal would not increase taxes. Initiative 153 would increase the state sales tax for 20 years by 0.62 percent to 3.52 percent. The revenue would be used to repay up to $6 billion in bonds to be used for state roads, local transportation needs and multi-model transportation projects. On Wednesday, the Colorado Secretary of State’s Office announced that Initiative 167 will be on the November ballot. Supporters of Initiative 167 submitted 169,568 signatures. To qualify for the ballot, an initiative needs 98,492 signatures. The Secretary of State’s Office does not, however, review all signatures that are submitted. Instead, the Office reviews a 5 percent random sample to project the number of valid signatures needed to exceed 110 percent of the 98,492. In the case of Initiative 167, the Office reviewed 8,479 signatures. Of this total, 5,644 were found to be valid, which then projects that 112,872 signatures would be valid of the total number submitted. In other words, the total projected percentage of valid signatures is 114.6 percent, which exceeds the minimum required 110 percent by 4.6 percent. Initiative 167, called “Fix Our Damn Roads,” has been put forth by Jon Caldara, the well-known chief of the conservative think tank, The Independence Institute. The Institute is often labeled “free market” or “libertarian” by the mainstream news media. The measure would require that the legislature pay from current revenue the debt service on $3.5 billion in transportation bond sales. Initiative 167 would require the legislature to first make debt-service payments before allocating General Fund revenue to such other programs as P-12 and higher education, corrections and social services, including Medicaid, which the Democratic-controlled legislature expanded in January 2014 under the Federal Affordable Care Act. In backing Initiative 167, many Republicans argue that the legislature should find room in the General Fund budget to pay for transportation infrastructure and are opposed to a tax increase. Colorado Springs Mayor John Suthers, the former Republican Colorado Attorney General, has endorsed the proposal. Meanwhile, Democrats are concerned that, during the next recession, the legislature would be forced to make deep cuts in education, corrections and social-service programs because the $350 million would first have to be paid each year to service the bond debt. A state that defaults on bond payments faces the drastic prospect that its credit rating could be drastically downgraded, which would raise borrowing costs. As of August 1st, the Independence Institute had contributed most of the almost $300,000 that had been received by the issue committee, Fix Our Damn Roads, whose identification number is 20175031966 as assigned by the Colorado Secretary of State’s Office. Yesterday, the Colorado Secretary of State’s Office announced that Initiative 153 had qualified for the ballot. Advocates had submitted 195,499 signatures. The statistical projection was that 118,259 signatures would be valid, which is 120.07 percent of the required number of valid signatures. The Colorado Contractors Association and the Metro Denver Chamber of Commerce are leading a statewide coalition of civic and business organizations to advance Initiative 153, whose campaign is called “Let’s Go, Colorado.” Supporting Let’s Go, Colorado is an issue committee, Coloradans for Coloradans, which had raised $2 million as of August 1st. The Secretary of State’s identification number for the committee is 20185033931. For more information on the two transportation-finance ballot proposals, contact Loren Furman, CACI Senior Vice President, State and Federal Relations, at 303.866.9642. 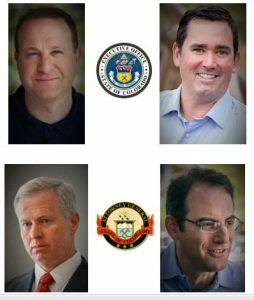 “Denver Chamber-backed transportation measure makes fall ballot,” Colorado Politics, August 23rd. “Fix Our Damn Roads’ transportation initiative qualifies for the Colorado ballot,” by Ben Botkin, The Denver Post, August 22nd. “Fix Our Damn Roads: No-new-taxes plan makes the Colorado ballot,” by Joey Bunch, Colorado Politics, August 22nd. Randy Brodsky, president of Primus Aerospace with Doug Barr of Hunter Douglas and Kreg Brown of EKSH at a recent MLG quarterly meeting. 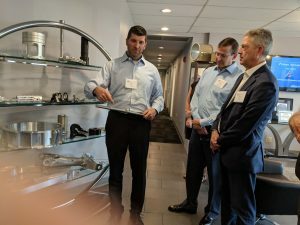 Randy Brodsky, president of Primus Aerospace hosted the Chamber’s Manufacturers Leadership Group (MLG) on August 15 for its quarterly roundtable discussion and tour of a Colorado manufacturing facility. Chamber members representing the manufacturing industry were joined by a representative from Senator Michael Bennet’s office, and the agenda included an overview of Primus followed by an opportunity to discuss best practices for addressing industry challenges, and a tour of the facility. Primus Aerospace provides high-precision, high-complexity machined components, kits and subassemblies for the aerospace, defense and space industries and serves customers across the globe with diversified and complex machined products, assembly services and engineering support, including machining, assembly, testing, design support, welding, grinding and finishing. In the EPA’s news release, the ACE plan is described as empowering states and energy independence, while taking advice, expertise and recommendations from more than 270,000 public comments during the December 2017 Advanced Notice of Proposed Rulemaking (ANPRM) to replace the Obama-era CPP. Along those lines, ACE will be subject to a 60-day comment period before it can be implemented and maintains the CPP’s “endangerment finding” that GHGs are a danger to public health and welfare. The proposed rule would likely affect more than 300 power plants across the U.S. and provide incentives to keep coal plants running as-is, rather than retrofitting with natural gas or renewable energy. Looking to start a new Colorado business? The state of Colorado has launched a new website to make that process much easier. MyBiz.Colorado.gov was developed jointly by the Governor’s office and the Secretary of State. The project engaged more than a half dozen state agencies working together to provide new businesses a better way to meet many state requirements. The project began because of Governor John Hickenlooper and Secretary of State Wayne William’s shared goal for Colorado to offer the best possible service for the business community. 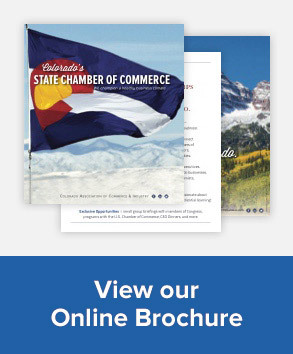 It’s this approach that gives Colorado its well‐deserved “business friendly” reputation and encourages so many new businesses to become part of our state. MyBiz.Colorado.gov provides a single system to interact with multiple state agencies responsible for new businesses, including the Secretary of State’s Office, Department of Revenue, Department of Labor and Employment, and Office of Economic Development and International Trade. The new site is accessible and intuitive, and efficiently helps businesses register with state agencies and obtain necessary licenses and permits. Users will find a resource library and tutorials to help plan and develop new businesses. There are numerous prompts along the way for help and to contact the right person who can answer questions. The site is also available in Spanish. With MyBizColorado.gov, you’ll find what you need in one place—instead of having to go to individual websites for the departments of Labor and Employment, Revenue, and others. The site will be especially helpful for small businesses that don’t have the resources or staff of big corporations. If you’re starting a business, take a look at MyBiz.Colorado.gov. The site was unveiled in early June and already thousands of business registrations and licenses have been issued to users of the system. The Department of Revenue Division of Taxation held a stakeholder work group on December 5, 2017 to discuss a potential rule on sourcing retail sales in Colorado to determine which jurisdictions may impose tax on the sale. As a result of that work group, the Department is soliciting public comments on a draft rule dealing with the sourcing of retail sales and other rules conforming to the proposed sourcing rule. If you wish to provide comments on these rules, you may do so by reviewing the draft rules and submitting comments to dor_taxrules@state.co.us by Friday, September 7, 2018. Depending on the comments the Department receives, the Department plans to hold a rulemaking hearing on these rules later this year. Additional comments will be accepted until the rulemaking hearing is complete. Please contact Loren Furman at lfurman@cochamber.com or 303-866-9642 if you should have any questions regarding this matter.